Reader: ‘How to crowdsource a creative cultural district? Summary of advantages: 3-4 block downtown with a mix of architectural styles; moderate vacancy rate; mixed-use zoning allowing for apartments over storefronts; established, locally owned businesses including two coffeehouses; a successful multiplex movie theater; and cheap rent. Summary of disadvantages: Municipal focus on commercial outside of the downtown; no good restaurant downtown; no public transportation; coffeehouses not open during the evening; existing stable businesses are scattered around downtown rather than clustered; disengaged, jaded populace; only institute of higher education in town is a community college; very little money in circulation; downtown perceived as unsafe after dark; a couple of buildings with featureless side or rear faÃ§ades kill the streets beside or behind them. Response: You need two things to start. 1. An initial community of supporting creatives who will identify a destination that fits that level of support. For instance, if you can round up only thirty people out Freeport’s population of 26,000, then you should stick to a creative cultural cafe rather than a creative cultural district. 2. A business owner/developer ‘sponsor’ that’s willing to accommodate a group of future customers/tenants that will reduce his/her risk by having the group assure the business’s future success, in exchange for actually investing in what the group really wants. Depending on support, this could be the owner of an existing coffeehouse looking to expand hours, or a real estate developer looking to redevelop an existing building into retail, coworking and housing. When does the ‘crowdsourcing a cultural district’ effort come in? When there’s evidence of success. There’s really little real motivation for people to stay invested in such a campaign if there aren’t any signs that anything will come of it. However, if one ‘sponsor’ is willing to invest in the collective energy of a group representing the town’s most creative and progressive, then that one venue can become representative of what a cultural creative district in Freeport would be. Thus, the vision for a creative cultural destination (ie a single venue) is developed at the same time the vision for a creative cultural district is, perhaps aided by a visual crowdsourcing tool like Bubbly. Each informs and helps evolve the other. 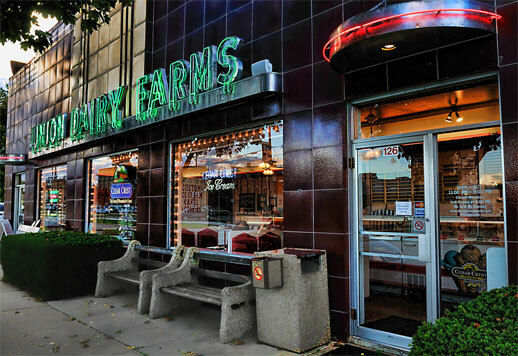 Photo of Union Dairy Farms diner/ice cream parlor, Freeport, Illinois by Pete Zarria. Since I posted my query, I dug up a couple of other interesting data: First, I was surprised to find that 1 in 6 workers in Stephenson County is employed in a professional or related field — compared with only 1 in 11 in the Chicago area! — and second, those workers make 45 percent more, on average, than the typical worker here. So while some people write off Freeport as a failed old industrial town with no money and where nothing ever happens, the fact is that there’s a LARGE class of creative workers here, and they’re the ones who have all the money!